You’ve all heard of working days but the big question is, who has heard of data days? I hadn’t and I work in IT. The individual who first mentioned to me about data days was a business banking customer services employee. It seems that, despite updating millions of financial records every second, any change of customer details is only committed to the central database once a day. This means that if you provided data to a customer services employee at your bank and they add it to their machine, it will not go live until up to a day later. I guess you could argue that this makes sense because expensive (both financially and computationally) integrity checks don’t have to be carried out that often but in the grand scheme of things, I don’t agree. The first issue is quite obvious and that is the potential for data loss. Luckily I’m a business customer so I can get through on the phones quickly and get something sorted. If they lost data I’d given them before the central databases were updated then its no biggie, but for those who had waited 30 minutes to speak to someone it would be a right pain. I’m not saying they lose any data, but it *could*, theoretically at least, happen. The second and more subtle issue is that these updates happen at 5pm. This means that despite the phones being open till 8pm on some nights, any updates that occur as a result of phone conversations after 5pm will not be seen to be updated until after 5pm the following day. Even if this data day practice has to happen, can’t it happen at 3am so that at least that days updates will be live the day after? I just find this shocking. The technology exists to do things in real time. We use it everyday. What would happen to the popularity of facebook if it took someone 24 hours before they could read a post on your wall? We don’t put up with it there so why should we put up with it from our banks? Annoyingly the banks are willing to invest in the technology to fix the issue where it involves money (try taking money from a cash machine and then checking your balance on another – you can be sure you don’t have to wait 24 hours to see the change). IT these days is very powerful but when used poorly like this it gets a bad name. I’m proud to work in IT but when I see IT being used as an excuse for this kind of poor practice I’m simply ashamed. Over the August bank holiday weekend I went to Solfest with Sarann and stayed at her house with some of her family. It was a great festival with some enjoyable musical acts and a great atmosphere. I was thoroughly impressed with the organisation and the wide range of bands and activities on offer. As an added bonus we experienced fine weather for the most part as well which is always nice. I feel sure I will return to the festival next year. As ever with my trips away I took a number of photos, just click the thumbnail to view them in my gallery. As part of a recent trip Heather and I made to York we took a ride on a steam train to Scarborough and spent the day there. I took a number of photos on the train and while in the town. I am currently on the train back from York and as we approached Doncaster the announcement came over the PA system to tell us we had nearly arrived at the station. The announcement was accompanied with a weather report forecasting dark clouds hanging over the area due to the fact the conductor’s mother in law resided in the city. Much laughter and amusement ensued throughout the carriage. As part of out short stay in York, Heather and I headed out to Scarborough for the day making use of a traditional steam train to get us there! I’m currently blogging from a National Express train heading northwards to York where I’m going to be spending a few days with Heather. Its a pleasant day but the train is rather full – sadly I don’t have a window seat so my favorite pass-time of staring at the countryside flying by is not an option. Still we have lots planned for the few days we’re in York, including some nice meals out, a few interesting museums and a trip on an old fashioned steam train to Scarborough for the day. This is likely to be marred by the weather which is forecast to be fairly poor for our entire stay. I think an umbrella purchase might be in order – as I write this I realise that I left mine in the hallway. I’ve uploaded the set of photos I took during a recent trip to Nefyn, North Wales, to my photo gallery. I experimented a little with the camera but mainly just aimed to capture the feeling of some of the places I visited. I particularly liked the pictures of the old quarry which, with the mist looming over the nearby mountains, look rather mysterious. I’ve noticed a fair few album views have taken place in my new photo gallery since its launch and while I’m happy to see people are taking an interest, it is a little disappointing to find that no comments have been made on any of the pictures. It was at this point I realised that perhaps folks didn’t realise that you could pass comment on gallery items and so I thought I’d make a point of mentioning here that you can. I’ve got both current photographs and galleries dating back many years so whether you are an old school friend marveling at how we’ve all changed or someone catching up on how things went at graduation there is sure to be something worth adding your words to. Have fun! In a similar vein to the “I have a house” posting I made a couple of days ago I now make one concerning my new car. 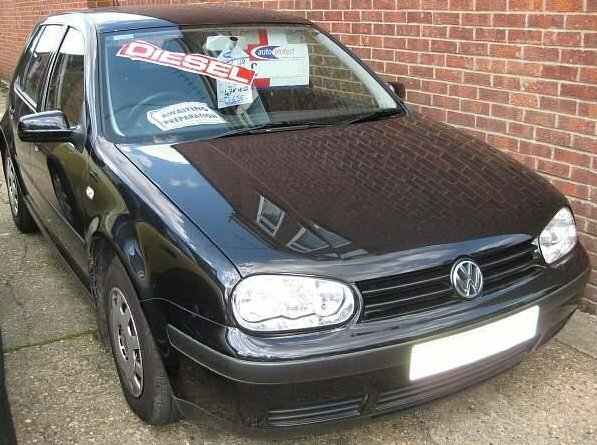 With my move to Swindon imminent it was deemed necessary to ensure I could get to work and get around once I was there hence the appearance of the Volkswagen Golf 1.9 SDI. Its a good little car and being a diesel will do a good mileage to the gallon which is always useful in these troubled times of high fuel prices and environmental mayhem. As with the house I provide one photo below the post but will be sure to upload some more photos to my gallery in the not too distant future. My having a car is also an important milestone as it is the first car I have ever owned and probably is the most prominent marker of me moving from a student to a professional lifestyle. That being said the main use I can think of for a car right now (outside of getting to work of course) is to visit all my friends from student days. Its good to keep in touch after all.